I’m not really an award kind of person. I share the reluctance of most introverts to toot my own horn, and the idea of submitting my writing to a panel of judges is nauseau-inducing. But after much encouragement from other authors, I took the plunge and submitted a draft of Blood Yellow to the Land of Enchantment chapter of Romance Writers of America, who have a yearly contest for unpublished manuscripts (the Rebecca, which you can read more about here). I was phenomenally gratified to have placed second in my category. That was cool enough on its own. But even cooler was that I got three professional critiques of the draft I submitted. The critiques were thoughtful and encouraging. They’ll be of great assistance when I go back to edit Blood Yellow. As gut-churning as entering my (unpolished) writing to a panel of judges was, it was wholly worthwhile and I’ll be submitting something again next year, not in the hopes of winning, but for those invaluable critiques. Now, on to blogger awards. 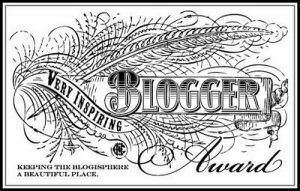 I’m shamelessly cribbing Nicholas Rossis’s idea regarding blog awards and putting them all in one place. Thank you so much to the wonderful fellow bloggers who have nominated my blog for awards! My first “publication” was in a tiny, local, literary journal. The story was called “The Nature of Love.” I was 14 when I wrote it. Having re-read that story as an adult, I’m deeply grateful that it has never appeared anywhere on the Internet. My first completed novel was a science-fiction story called “The Lure of Space.” I wrote it long-hand in a spiral-bound notebook. I finished it over Christmas, 1984. It was just over 75,000 words (I counted them since I didn’t have a word processor). Since then, I’ve re-written it over a dozen times. There’s nothing left of the original story except the main character’s name. I intend to publish it in 2018/9. I was given a broken-down moped for my 15th birthday by a family friend and the “gift” of rebuilding it under his tutelage. I remember being incredibly resentful at the time – why hadn’t he just repaired it before giving it to me? Now I consider it one of the most precious gifts I’ve ever been given. Not only did I absorb a great deal of mechanical knowledge while rebuilding it with him, but the restored moped gave me unimaginable freedom. I’m not a “car person,” and struggle to differentiate car models. But having a car has always been important to me, mostly so I could get to the bookstore. I’ll admit I talk to my cars, and they’ve all had the same name (“Rocket” from Robert McCammon’s Boy’s Life). Although I write about imaginary people and places, I believe in “writing from what you know.” I incorporated my experiences keeping domestic rabbits and spinning fire poi into Snowburn. For Snowburn’s sequel, Throwing Fire, I took up free-running (Parkour) for a short time. I’m not very good at free-running, and racked up more scars in a couple of months than I have in three years of spinning fire. Fire poi spinning is, yes, just as dangerous as it looks (video below with commentary from the Child). I’ve caught my hair, my clothes and the ground on fire. The most serious burn I’ve suffered, though, was not from the burning bits themselves, but from handling the hot chains afterward (ouch). I’ve visited forty-eight of the fifty states. I missed out on Hawaii and Alaska before I moved to the UK. Maybe someday . . .
I’ll tag each of these bloggers and hope that they’ll share 7 facts with us as well as point us on to other great blogs! E J Frost is a participant in the Amazon EU Associates Programme, an affiliate advertising programme designed to provide a means for sites to earn advertising fees by advertising and linking to Amazon.co.uk.